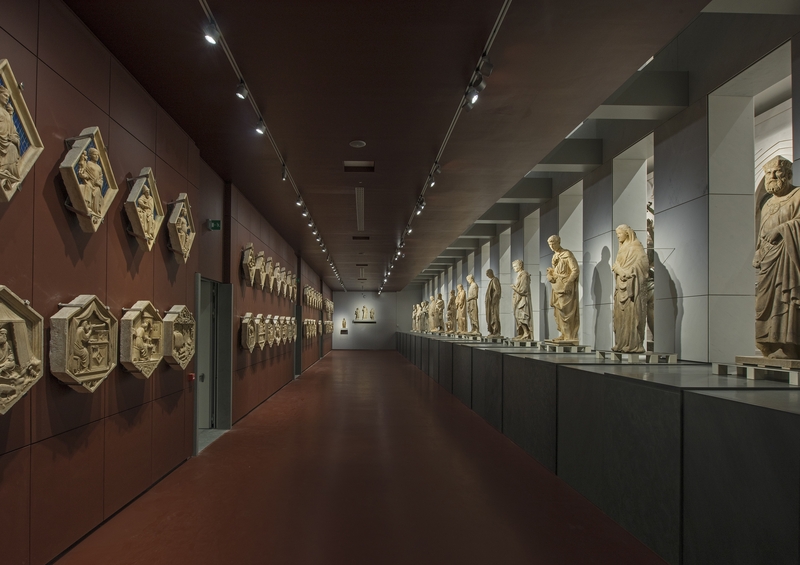 After more than 20 years of planning and execution and 45 million euros spent, the Museo dell’Opera del Duomo (the Museum of the Works of the Cathedral) in Florence reopened to the public on Thursday. 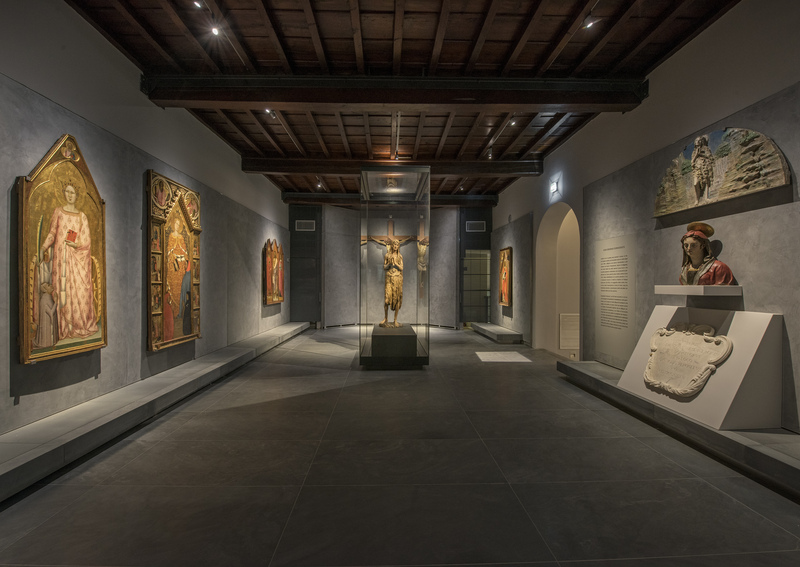 More than 750 artworks — paintings, textiles, architectural models, sculptures — are on display in a completely redesigned space that finally allows the museum to exhibit monumental pieces from the exterior and interior of the Duomo, the Baptistery of San Giovanni and Giotto’s Campanile (bell tower). The Museum of the Works now houses the largest collection of Florentine sculptures from the Middle Ages and Renaissance in the world, statues and reliefs in marble, bronze and precious metals by such towering figures as Lorenzo Ghiberti, Donatello, Luca della Robbia, Antonio Pollaiolo, Andrea del Verrocchio, Antonio del Pollaiolo and Michelangelo Buonarotti. More than 200 of these works have never before been on public display before because exhibition space was so limited. The acquisition in 1998 of the Theater of the Intrepids, an 18th century playhouse built on the site of Renaissance artists’ workshops that had once belonged to the Opera, allowed the museum to more than double its space. Because the theater had long since been gutted and was being used as a parking lot, there was nothing of historical or architectural interest to preserve. This allowed the architects to restructure the old museum and the theater, fusing them together into a single logical space. There are now more than 6,000 square meters (64,600 square feet) of room for the masterpieces from the history of the construction of this great church to spread out and breathe in 25 rooms over three floors. To accommodate monumental pieces that were made to be viewed from afar, several large halls were created ranging in size from sixty to a hundred feet long with ceilings twenty to fifty feet high. 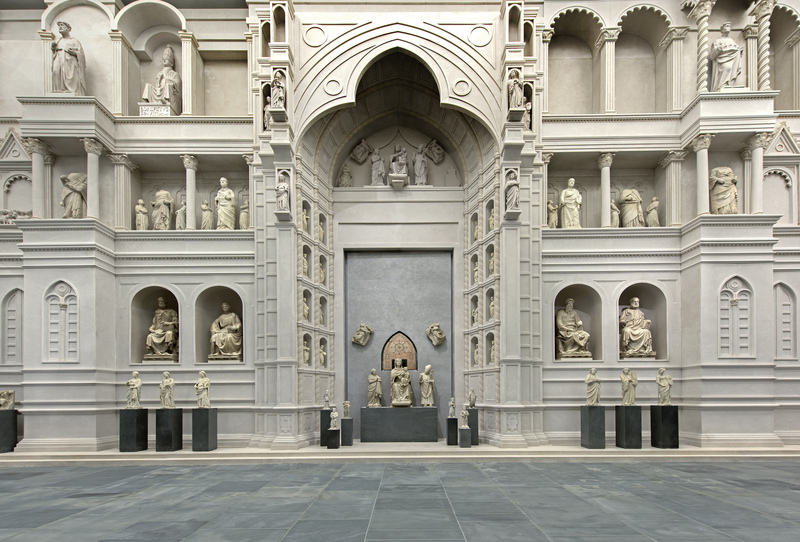 The flexibility afforded by the theater large, empty theater building solved the museum’s thorniest problem: how to properly exhibit the elements of the Duomo’s original facade designed by Arnolfo di Cambio in the late 13th, early 14th century. 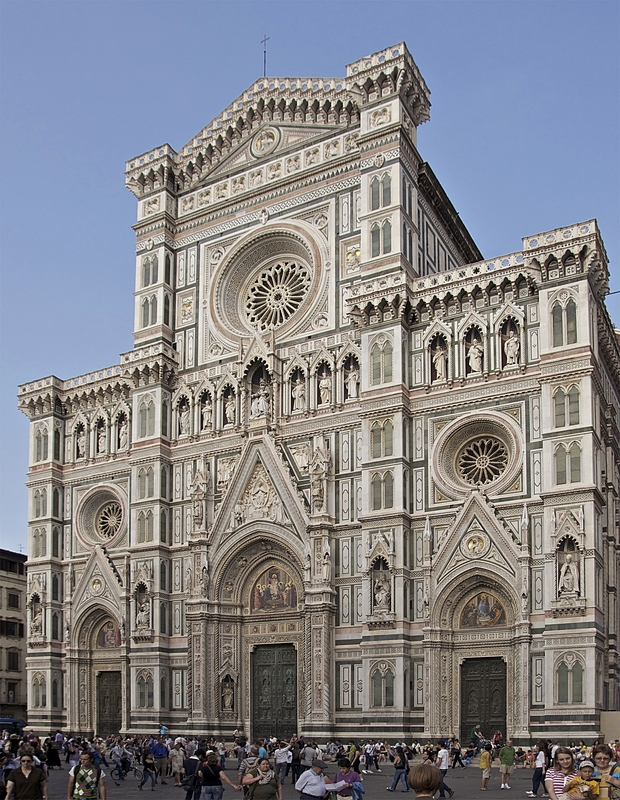 Arnolfo’s facade was incomplete at the time of his death (sometime between 1302 and 1310), covering only the bottom third of the church. 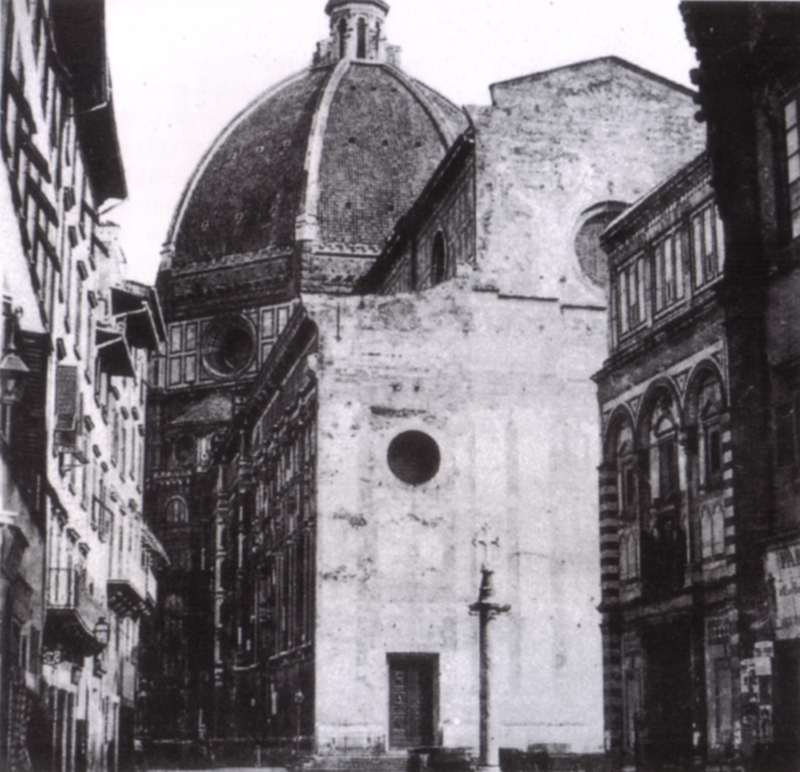 Standing next to the multicolored marble facades of the Baptistery and Campanile, its whiteness where finished and roughness where unfinished were much criticized. Over the years various contests were launched to find a solution but they came to naught. Finally in 1587, the Medici Grand Duke ordered the court architect to demolish the facade and replace it with a brick veneer painted in Mannerist style. In 1688 that was repainted with fake columns and architectural details on the occasion of the wedding of Grand Duke Ferdinand to Violante Beatrice of Bavaria. That paint job was faded to all but nothingness by the mid-19th century. The white, green and red marble facade we know today is shockingly recent, designed by Emilio de Fabris to coordinate with the other striped structures in the complex and constructed between 1876 and 1886. The Opera managed to keep most of the facade, despite the inexplicable lack of care taken to preserve the works during demolition, in its store rooms. 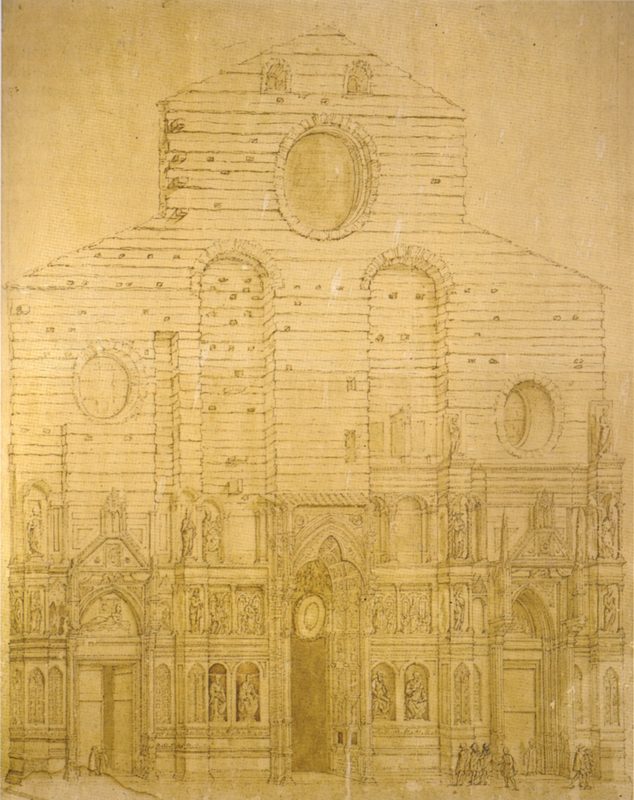 It also kept in its archives the only surviving drawing of Arnolfo’s original facade: a 17th century copy of a sketch drawn by Bernardino Poccetti in 1587 just before demolition. When the Museo dell’Opera opened in 1891, the monumental figures from the facade couldn’t possibly fit. 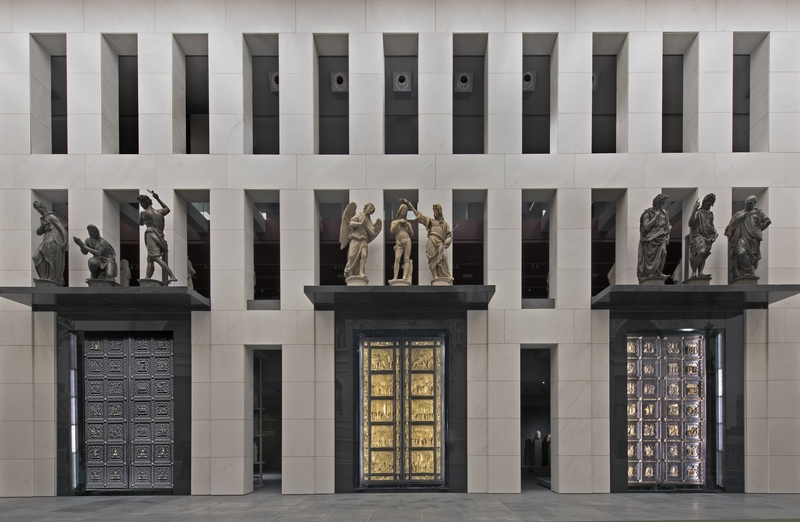 The best it could do was exhibit a little wooden maquette of the facade while more than 100 original pieces — 40 statues, 60+ architectural features — stagnated in storage. The lofty spaces of the theater gave the museum the opportunity to do something extremely cool about the facade: reconstruct the whole damn thing indoors. Using the Poccetti sketch as a guide, architects recreated the 14th century facade along one wall of the 1,500-square-foot great hall. The sculptures and reliefs were positioned in their original locations, with a few select pieces of particular importance being brought down to the museum floor so visitors can actually see them while plaster copies were put in their original places. 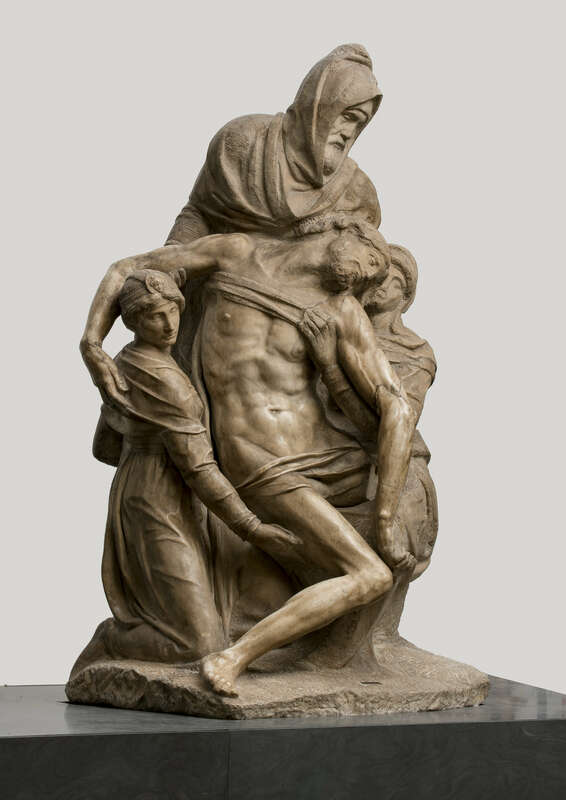 Other rooms are dedicated to important works and history, like Donatello’s Penitent Magdalene (1455), Michelangelo’s unfinished and all the more beautiful for it Bandini Pietà (ca. 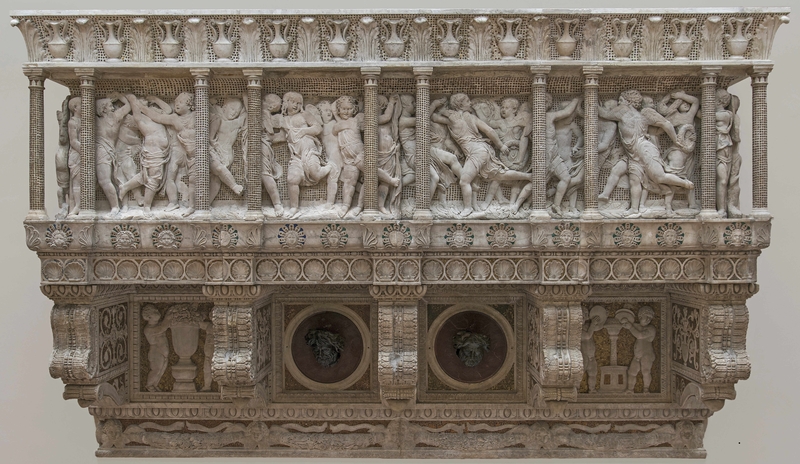 1547–1553), and the two intricately carved choir lofts that once stood above the doors of the sacristies inside the Duomo, one by Luca della Robbia (completed in 1438), the other by Donatello (completed in 1439). These masterpieces of early Renaissance sculpture were removed by order of groomzilla Grand Duke Ferdinand because he considered them too passe’ for his fashionable wedding. He replaced them with massive Baroque choir lofts. The great dome of the cathedral designed and built by architect, artist, goldsmith and inventor Filippo Brunelleschi also get its own hall. 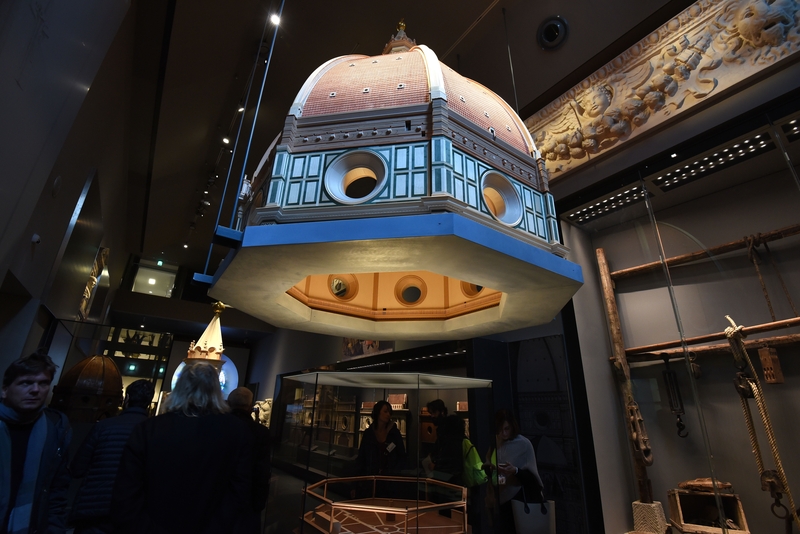 It houses original wooden models of the cupola and lantern and, incredibly, some of the pulleys and gear Brunelleschi devised to get construction materials 170 feet off the ground. I haven’t been able to determine if the 9-foot scale model of the dome discovered under the floor of the theater during construction in 2012 has been integrated into the museum as was discussed at the time. Basically, this is a whole new museum. If you’ve been to the Museo dell’Opera before, you have all the reason you need to get back there stat because its previous incarnation bears no resemblance to its current splendor. This entry was posted on Tuesday, November 3rd, 2015 at 11:22 PM	and is filed under Medieval, Modern(ish), Museums, Renaissance. You can follow any responses to this entry through the RSS 2.0 feed. You can skip to the end and leave a response. Pinging is currently not allowed. 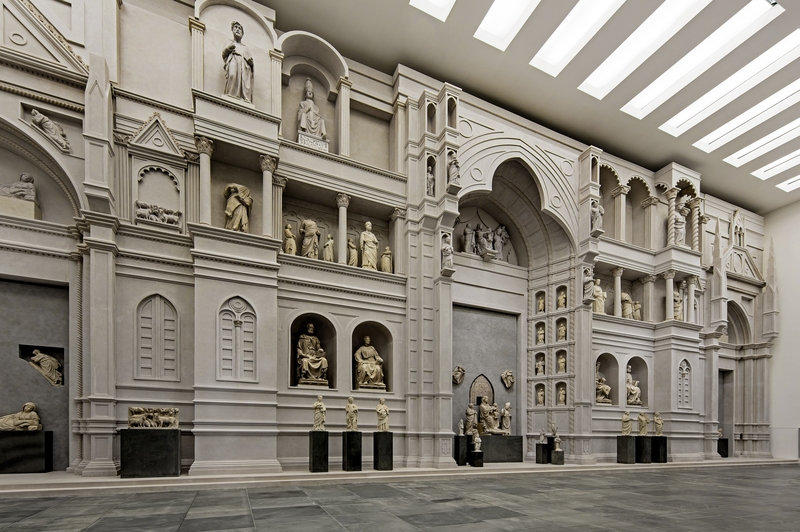 The new Museo dell’Opera del Duomo really is jaw-dropping–and another benefit is that we now have extensive clusters of sculptures from the circles of Arnolfo di Cambio, Andrea Pisano, etc., allowing us to form clearer impressions of their artistic personalities. Actually, one chunk of the old Teatro degli Intrepidi did surive–and was painstakingly restored–the ceiling of the main stairway (elegant floral rococo classical stucco work). The two Ghiberti doors from the Baptistry are on view (and can also be seen from the back, which is very cool) but the oldest set of doors, by Andrea Pisano, is yet to be installed. One slightly disconcerting aspect of the museum’s installation is that the wall texts are often more inspirational than informational–but…well…it is the Work of the Cathedral. Papa Francesco will be in Florence on 10 November and will presumably stop by. I’m so glad you commented! I almost called you out in the post, but decided not to hound you just this once. 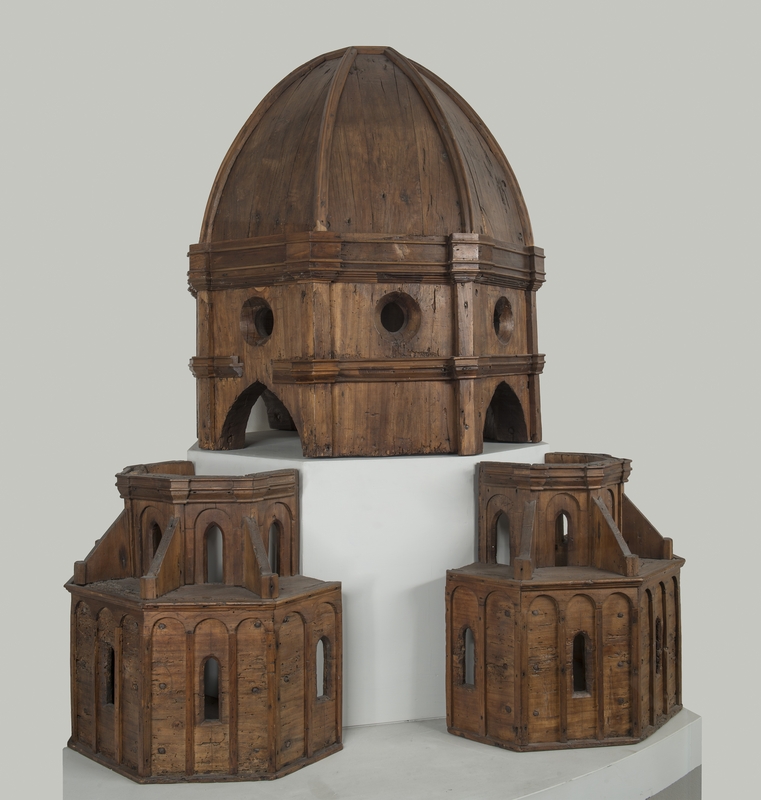 Do you know what became of the spina di pesce brick dome model they found in the theater? I deliberately chose not to use the photograph of the words on the wall in the museum’s press package because seriously what the hell. I have a short fuse for the jumble-of-words school of interior design on HGTV renovation shows. To see it in a museum like this that has taken such an innovative and intelligent approach to showcasing its brilliant collection gives me agida. I didn’t realize until after my first visit that the seeming well under the floor is in fact Brunelleschi’s test drive for the cupola. It is now covered by a plexiglass (or something)lid–so you can walk over it…awesomely enough. The next time I stop by there, I will snap a photo for you. I too have very little patience for messaginess in museum installations– but, no one is forcing us to read those icky wall texts. Otherwise, the traditional labels on individual objects are a bit weak (I would have liked more information about materials, etc.) but there is some really terrific electronic touch-screen stuff scattered around.